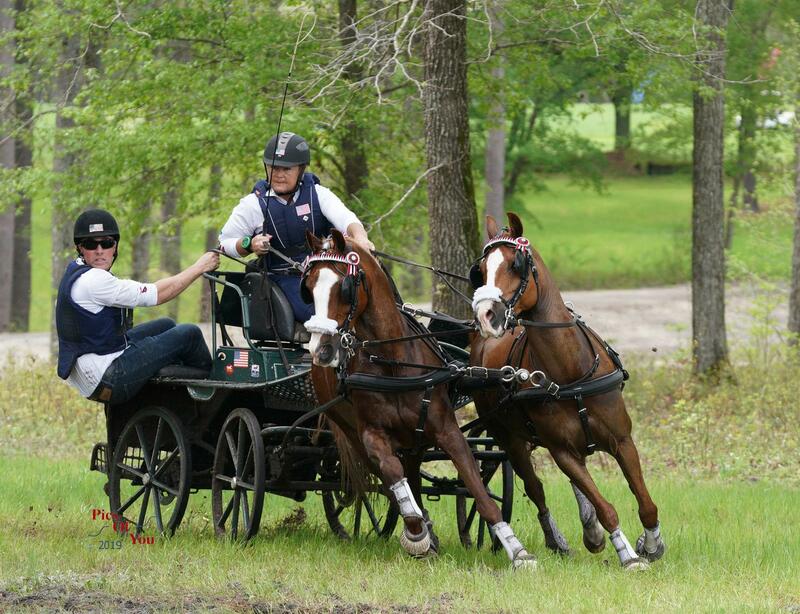 Raeford, N.C. – The exciting marathon phase took place Saturday at the Southern Pines Combined Driving Event (CDE) with the USEF Advanced Pony Combined Driving National Championships competitors moving one step closer to earning a title. The marathon course proved influential to the overall standings heading into Sunday’s cones phase. Defending champions Jennifer Keeler and Amazing Grace leapt into the lead following the second phase of the single pony championship. Keeler (Paris, Ky.) and her nine-year-old Dutch Harness cross mare executed a speedy marathon performance to have the fastest times at each of the obstacles and win the phase with 72.49 penalty points. They stand in first on a total score of 127.50 penalty points. Leslie Berndl and Sweetwater’s Zorah Belle climbed the leaderboard after tallying 83.28 penalty points in the marathon phase. Berndl (Lexington, Ky.) and Teressa Kandianis’s 15-year-old Norwegian Fjord mare sit in second place on a total score of 138.78 penalty points. Rebecca Gutierrez (Windsor, S.C.) and Naria BW 6, Mary-Anne Mitchell’s 16-year-old Haflinger mare, collected 80.86 penalty points in the marathon phase to lie in a close third place on a total score of 138.84 penalty points. Katie Whaley maintained her lead in the pair pony championship field after the second day of competition. 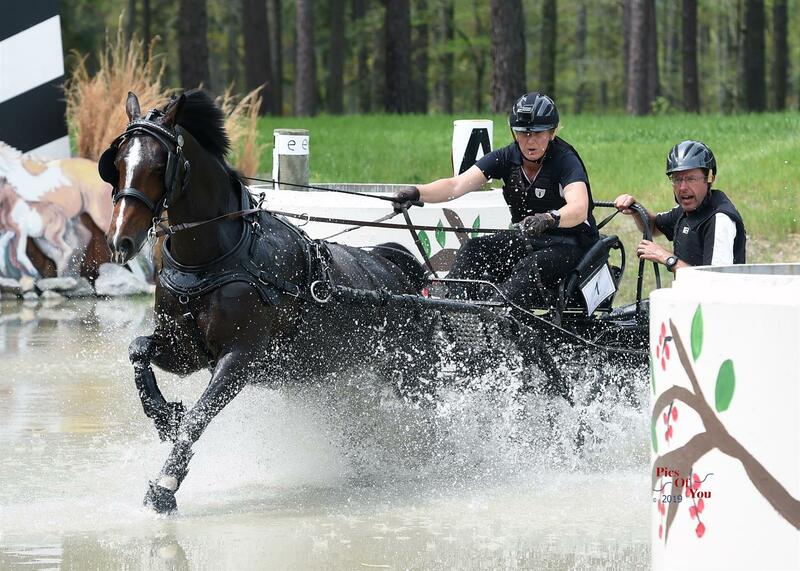 Whaley (Paris, Ky.) expertly guided her Welsh geldings in the marathon phase, having the fastest times in four of the obstacles and tallying 82.79 penalty points to win the phase. They head into Sunday on a total score of 140.57 penalty points. Both combinations of Keady Cadwell and Deborah Branson’s Welsh cross pair and Mary Phelps and her American Shetland Pony pair finished the marathon phase a score of 91.17 penalty points. Cadwell (Southern Pines, N.C.) is in second place on a total score of 158.39 penalty points, while Phelps (Columbia, Ky.) is not far behind in third place on a total score of 158.50 penalty points. Wendy O’Brien (Aiken, S.C.) ran into unfortunate trouble at obstacle three, resulting in her being over the time limit and thus eliminated. Competition concludes Sunday with the first championship competitor beginning the cones phase at 11:18 a.m. ET.